Tawny Frogmouth (Podargus strigoides) Do You See It? We drove down to Miami this week, 200 miles, went to Zoo Miami twice and drove home. Simple statement, but what we saw was fantastic. Just the ride down allowed us to observe some of our own wildlife. Those highlights were 2 Northern Crested Caracaras (one standing along the road), a Cooper’s Hawk, a Red-shouldered Hawk, several other hawks (unknown) and a Roseate Spoonbill flying by. The rest of the birds were just our normal Grackles, Doves, Egrets, Herons and Crows. All of those 85 species in there are free to fly and or swim around. Many species have 2 or more birds represented by couples, nests and young. The staff are also very helpful and friendly. After they found out that we were really interested in the birds, they sort of took us “under their wing.” Our special thanks to Dolora, Stacie, Ezekial, Carl and the others. Where do you begin to tell about the thrill of seeing birds that you have read about, only seen photos of, or never even heard of before? With over 10,000 birds in the world, any time you get to see them for real is exciting, even if they are at the zoo. The birds of Asia and a few from other countries were not just standing there waiting on you to look at them. No, that place is so large that you actually have to do some birdwatching. At times I felt like I was out in the field trying to find the birds. Because of the help from the staff we were able to see many more than we would have on our own. 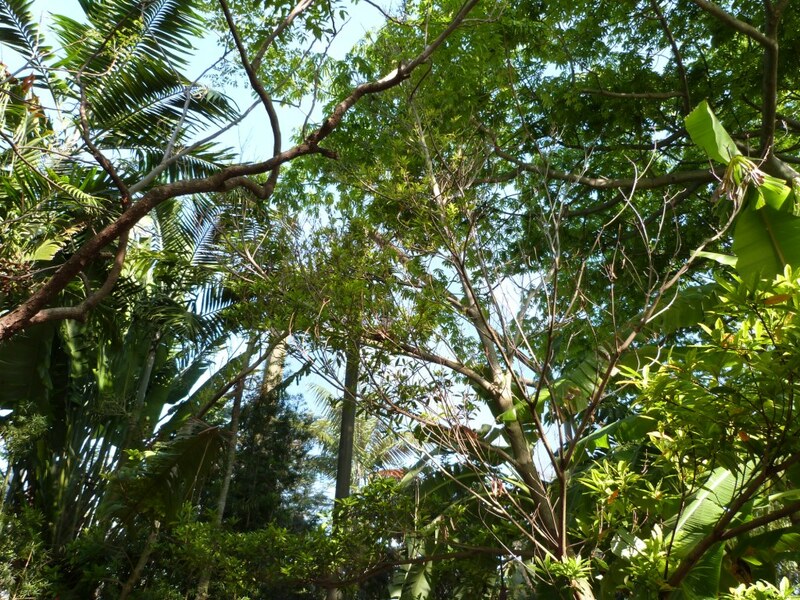 We were able to see the Cloud Forrest and the Amazon and Beyond small aviaries. More on that later. Overall I took over 1,000 photos and not sure how many Dan took. It is going to take awhile to sort through them and put the right name on the right bird photo. We were extremely tired when we got in last night and so have not started working on them yet. I did want to share one bird that was on my “most want to see” list. Again, it took the help of the keepers to point it out. I had walked under it several times on Wednesday and never saw it. The Lord has provided the Tawny Frogmouth with a fantastic protection. It looks like the bark on a tree. It also has a very big mouth and hence its “frogmouth” name. 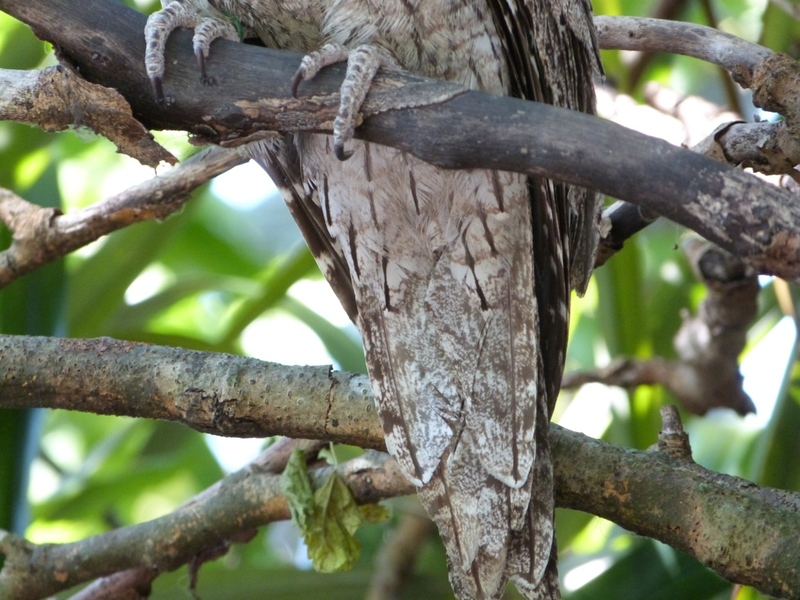 They are in the Podargidae – Frogmouth Family which is in the Caprimulgiformes Order. I was amazed at how large it actually was because it is hard to judge size from photos. 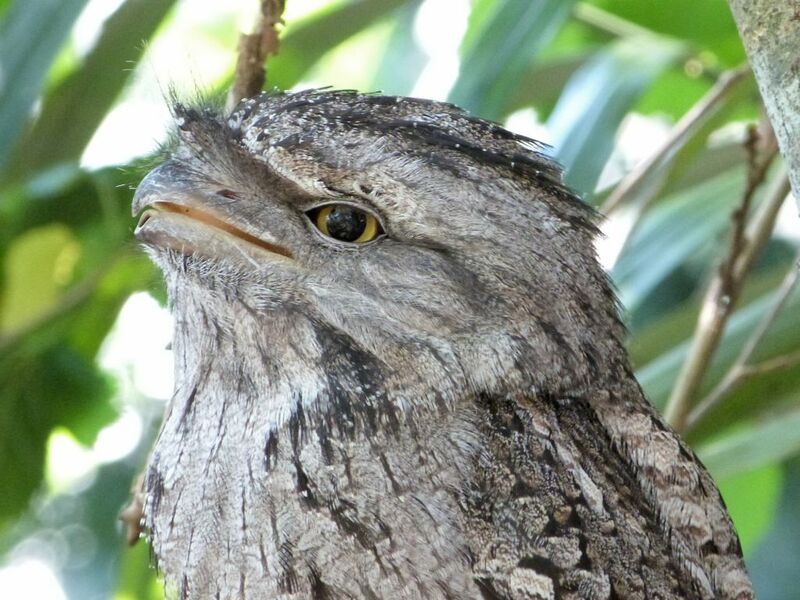 Wikipedia says – The Tawny Frogmouth is often mistaken to be an owl. Many Australians refer to the Tawny Frogmouth by the colloquial names of “Mopoke” or “Morepork”, which usually are common alternative names for the Southern Boobook. Frogmouths are not raptorial birds. Males and females look alike and are 35–53 cm (14–21 in) long. This very bulky species can weigh up to 680 grams (1.5 lbs) and, in overweight zoo specimens, up to 1400 grams (3.1 lbs). This species thus reaches the highest weights known in the Caprimulgiformes order. They have yellow eyes and a wide beak topped with a tuft of bristly feathers. They make loud clacking sounds with their beaks and emit a reverberating booming call. Tawny Frogmouths hunt at night and spend the day roosting on a dead log or tree branch close to the tree trunk. Their camouflage is excellent — staying very still and upright, they look just like part of the branch. When feeling threatened, the Tawny Frogmouth stays perfectly still, with eyes almost shut and with bill pointed straight, relying on camouflage for protection. The Tawny Frogmouth is almost exclusively insectivorous, feeding rarely on frogs and other small prey. They catch their prey with their beaks rather than with their talons, another way in which they are different from owls. 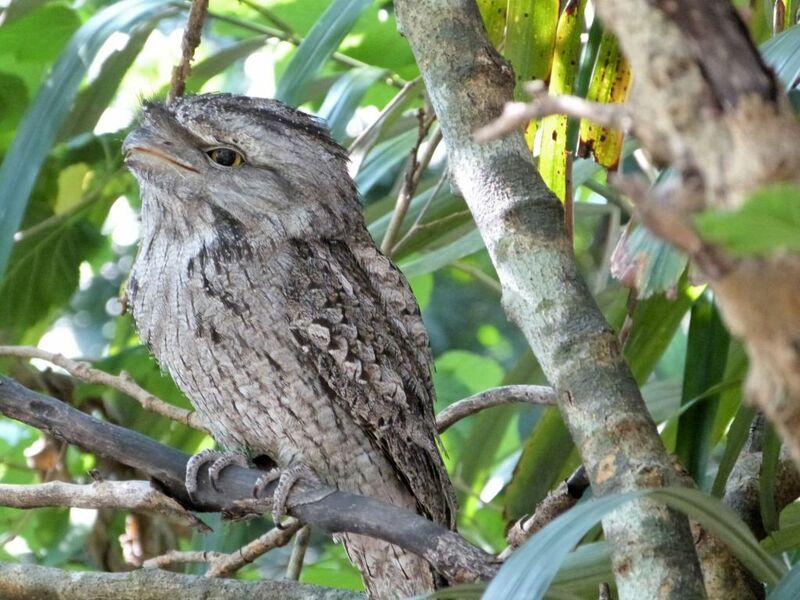 Owls fly around at night hunting food, but Tawny Frogmouths generally remain sitting very still on a low perch, and wait for food to come to them. They catch prey with their beaks, and sometimes drop from their perch onto the prey on the ground. The bird’s large eyes and excellent hearing aid nocturnal hunting. Tawny Frogmouths and owls both have anisodactyl feet – meaning that one toe is facing backwards and the other three face forwards. However, owls’ feet are much stronger than the feet of the Tawny Frogmouth as owls use their feet to catch their prey. Owls are also able to swing one of their toes around to the back (with a unique flexible joint) to get a better grip on their prey. Tawny Frogmouths have fairly weak feet as they use their beaks to catch their prey. Owls eat small mammals, like mice and rats, so their bones are shorter and stronger than those of Tawny Frogmouths which usually hunt smaller prey. Tawny Frogmouths typically wait for their prey to come to them, only rarely hunting on the wing like owls. 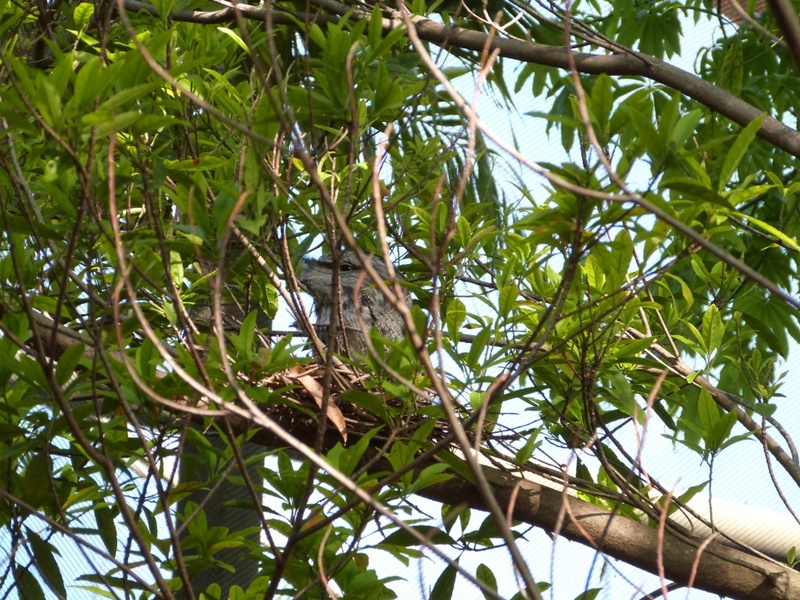 Breeding – Tawny Frogmouth pairs stay together until one of the pair dies. They breed from August to December. They usually use the same nest each year, and must make repairs to their loose, untidy platforms of sticks. After mating, the female lays two or three eggs onto a lining of green leaves in the nest. Both male and female take turns sitting on the eggs to incubate them until they hatch about 25 days later. Both parents help feed the chicks. I have many more adventures to share from Zoo Miami. Praise the Lord for a great trip to see more of His fantastic Creative Hand in person. Zoos are a favorite of mine along with being in the field birdwatching. The birds that they collect are many times endangered or are being threatened by lost of habitat. One of the commands that the LORD gave man was to be responsible for or have dominion over the birds and other critters. Dominion does not mean be cruel to them but to help them and Zoo are one of those places. This entry was posted in Birds and tagged Birds, Birdwatching, Birdwatching Trips, Christian, Florida, Frogmouth, Wings of Asia, Zoo Miami. Bookmark the permalink. Thanks, Myra, this is only the first article. I have so many more running around in my head. I was over-whelmed by Wings of Asia.